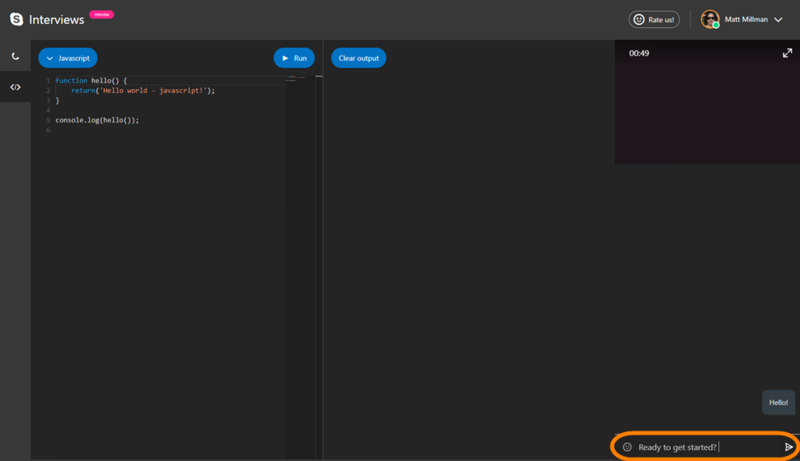 With Skype interviews you can evaluate technical candidates using a real-time code editor over Skype in your browser. You don't need to sign up or download anything. Just go to Skype.com/interviews and click Start intervew. Which browsers are supported in Skype interviews? All features are supported on Microsoft Edge and Google Chrome (version 32 and above). Firefox only supports the code editor. Safari and mobile browsers are unsupported. 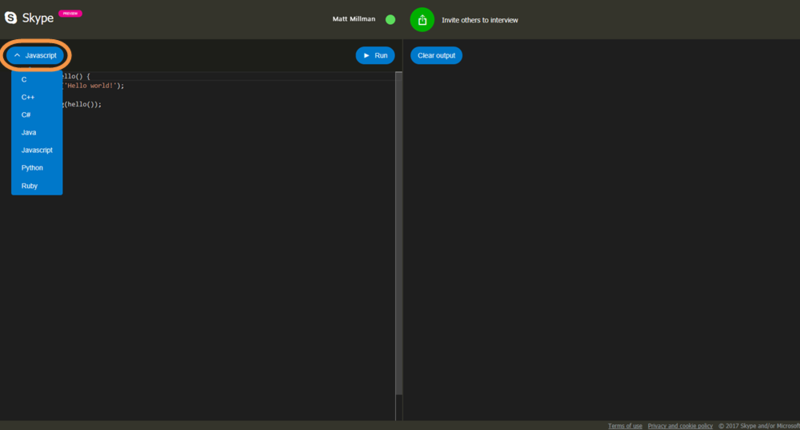 Which coding languages are supported by the code editor in Skype interviews? How do I switch between coding languages in Skype interviews? How do I execute my code in Skype interviews? Tap the Run button in the upper-right corner of the code editor. How is my code executed in Skype interviews? Every code execution is happening inside its own isolated Docker container. After your code returns or times out after 10 seconds, your Docker container will be killed and removed along with all the code inside it. Why is Skype interviews asking for video and microphone permissions? Video and microphone permissions are required for video calling. You can use Skype interviews without video calling by clicking Continue without calling. Is participation limited to two participants in Skype interviews? No, Skype interviews uses the same group chat functionality of Skype. You can add as many people as you like, the same way you would in Skype on your mobile device or desktop. How do I chat with other participants in Skype interviews? The chat interface is on the right side of the screen. Just type in the message box, and then click the send button. How do I send a file to other participants in Skype interviews? In the message box, click the attachment icon, select the file you want to send, and then click the send button. The maximum file size that can be sent is 100 MB. How do I save my code in Skype interviews? Click the Download button to save the code you've written. Is there an API for Skype interviews? Yes, there is! You can customize, schedule, and share interview links with the Skype interviews API. You can learn more here: https://skype.com/interviews/api. You can use our scheduler at https://skype.com/interviews/scheduler. Learn more about scheduling interviews.